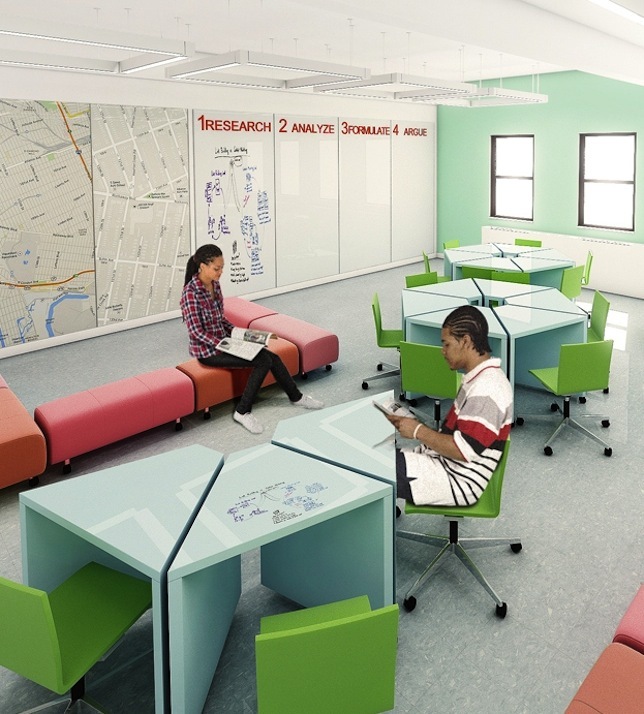 An initiative in New York City to improve the college and career preparedness of young black and Latino men is redesigning physical spaces of three high schools to support a new educational model that incorporates competency mastery and design thinking, among other aspects. EPIC High Schools, which opened in fall 2014, has been working with Kurani, an architecture firm, to develop a campus prototype that could work in eight city locations. The results provide designs for 17 classrooms and a number of common spaces and amenities. The designs resulted from a six-month planning process that included workshops with the schools' founders to understand their vision, walking tours of the neighborhoods where they'll be serving students, completing socio-economic and demographic research, and engaging with a broad group of stakeholders: students, teachers and community members. Among the "co-creation" processes followed were live curriculum experiments in different learning environments. "The resulting design is a culturally-relevant campus environment equipped with exploration labs, meditation space, a build barn and a trust forest," said Danish Kurani, lead architect in a blog post about the project. "This is no pie-in-the-sky design. The concept takes into consideration very realistic challenges that many New York City schools face: sharing a campus with multiple other schools, accommodating hundreds of students on a single floor, updating derelict and outdated facilities, and creatively manipulating the [28-foot by 28-foot] structural grid. Our design demonstrates how to navigate these endemic challenges while shaping an environment tailored to the specific needs of school users, curriculum and [the] EPIC Schools model." EPIC is currently in the process of raising funds to convert the 1960s facilities they were provided by the city to the new campus prototype.